Spanning an area twice the size of Great Britain, the Brookfield Rail's rail network extends from Geraldton in the north of Western Australia, to Leonora and Kalgoorlie in the east, and south to Esperance, Albany and Bunbury. As the only network in the southern half of the state, it provides vital access to the eastern states and overseas markets through the region’s six government-owned ports. The network annually handles over 70 million tonnes of freight, including grain, iron ore, coal, alumina, and bauxite, and provides passenger services on the Perth to Kalgoorlie and Perth to Bunbury lines. With plans to increase annual freight volume to up to 100 million tonnes, Brookfield Rail regularly undertakes a number of maintenance and major projects to ensure the network remains safe, efficient and reliable for the long term. To meet these demands, Brookfield Rail adopted Nearmap’s browser-based PhotoMaps™ technology, with its unique timeline capability, enabling it to dramatically increase asset management efficiency, improve data accuracy, improve operational continuity and minimise site visits. At the same time, it streamlined incident response by supporting maintenance crews and emergency services with precise locational coordinates and site information, enabling them to reach even remote locations faster, safely, and better situationally prepared. Moreover, Nearmap’s comprehensive suite of visual-analytical and accurate measurement tools allowed Brookfield Rail to greatly reduce site survey costs, and improve planning and budgeting efficiency for capital works and maintenance programs. The company previously used satellite imagery to support its asset management, but the low resolution photographs were unable to provide the clarity required for confident asset identification. By switching to Nearmap, it gained immediate, substantial benefits. 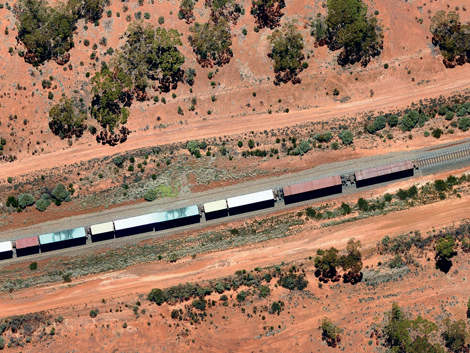 “When you compare the clarity of Nearmap’s PhotoMaps™ with the little green and brown smudges of satellite imagery, you quickly realise they’re chalk and cheese,” said Brad Douglas, Brookfield Rail’s Technology Manager (Operations). Brookfield Rail uses Nearmap to measure infrastructure, such as sidings, yard layouts and loop locations, and provide a detailed survey of assets on the ground. From the company’s point of view, this isn’t just a measurement of distances, it’s a financial calculation that enables it to plan and budget efficiently, and achieve significant savings on survey costs. 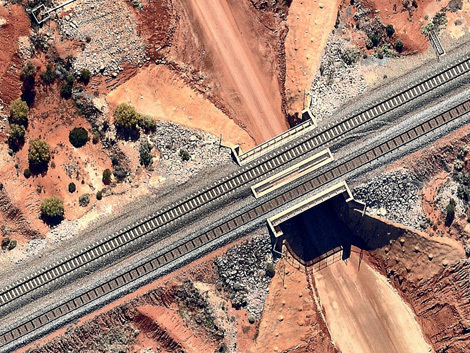 Nearmap improved Brookfield Rail’s ability to respond quickly and effectively to critical events in its rail network by enabling it to direct emergency teams to the site with precise geolocational coordinates. The company also uses PhotoMaps™ to support maintenance crews, and newer employees who have little familiarity with the landscape. Nearmap’s mobile capability further assists employees in the field by supporting mobile access to required information from a mobile phone or tablet, simplifying communication with main office, and enabling them to verify, or update, asset maps.